DNA tests on the five feet found on shorelines of B.C. 's south coast confirmed two were from the same person, but there were no signs any were severed from bodies by tools or trauma, the RCMP said Thursday. 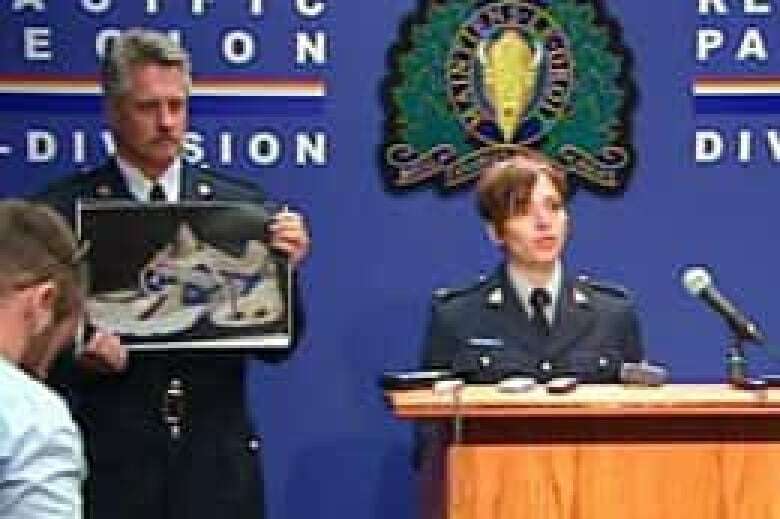 All the feet, discovered in the past year, were encased in athletic shoes, the specifics of which were released by the RCMP in Vancouver on Thursday. The two feet that were from the same person were found on Valdes and Westham islands in February and June. They were in men's size 11 Nike shoes, manufactured in 2003 and sold across North America. "The B.C. Coroners Service has confirmed the remains of a right foot found on Feb. 2, 2008, on Valdes Island, and the remains of a left foot found June 16, on Westham Island, are from the same male," said Jeff Dolan, coroners service executive director for regional operations. The man has not been identified, nor have any of the other remains. The coroners service said the right foot found on Kirkland Island in May 2008 is from a female. There's no evidence the five feet became separated by anything other than decomposition, the RCMP said. "We want to make it clear: there is no evidence that these feet had been severed. There were no tool markings and no visible sign of trauma," Const. Annie Linteau said Thursday. "It appears that these feet have naturally disarticulated from the bodies through natural process." Police released pictures of the runners the feet were found in, hoping that someone might recognize them as the type worn by a missing loved one. The RCMP have solicited expertise from a forensic anthropologist, a forensic pathologist, oceanographers and a forensic entomologist to help their investigation. RCMP are now attempting to match the feet with missing persons files using DNA. They have eliminated 130 of 243 possible male matches so far, Linteau said. DNA testing on the feet cannot determine race or age, police said. Studies of local currents indicate the feet likely came from the southern portion of the Strait of Georgia, which separates the Lower Mainland from Vancouver Island. RCMP said they have not yet ruled out the theory that the feet might have come from people on a plane that crashed in the Strait of Georgia near Quadra Island three years ago. The first foot was located on Aug. 20, 2007, on Jedediah Island. The shoe is a Campus brand running shoe, primarily white with blue mesh, and is believed to be a size 12. It was produced in 2003 and distributed primarily in India. 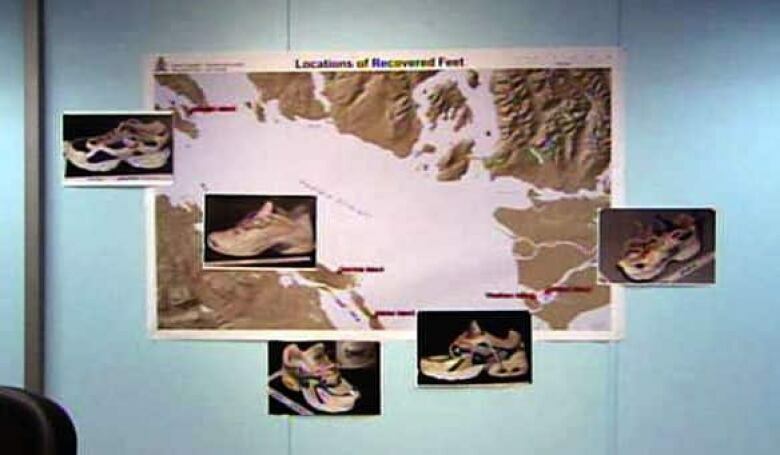 The second foot was located Aug. 26, 2007, on Gabriola Island in a men's white Reebok running shoe, size 12. It was produced in 2004 and distributed globally, but mostly in North America. It was first available on March 1, 2004, and is no longer sold. The third foot was located on Feb. 8, 2008, on Valdes Island. It was inside a men's blue and white Nike running shoe, size 11. It was produced in 2003 and sold in Canada and the United States from Feb. 1 to June 30, 2003. The fourth foot was located on May 22, 2008, on Kirkland Island. It is a woman's blue and white New Balance running shoe, size 7. It was produced in June 1999 and distributed through major retail stores. The fifth foot was located on Westham Island on June 16, 2008, and matches the third foot and shoe.